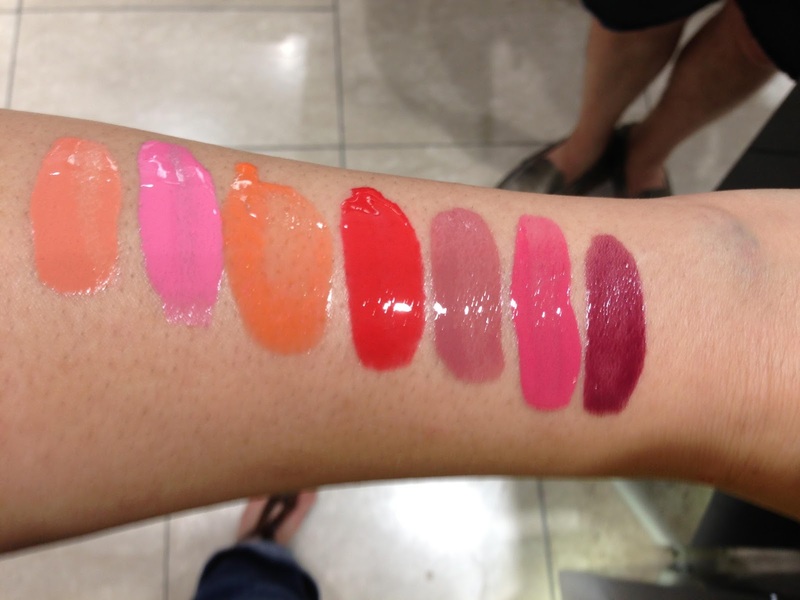 From left to right: Chic, Swingin', Fresh, Revenge, Rose Bar, Tadzio, Suspicious. 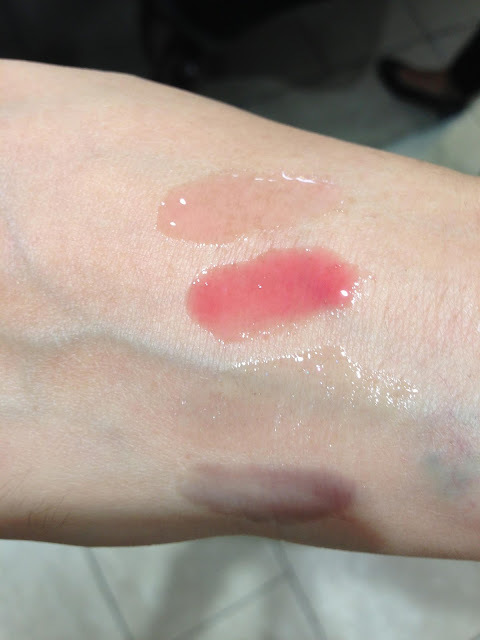 The Cheek Polishes are extremely watery and sheer, but, most likely, they can be layered to achieve a more intense wash of color. Revenge is my favorite, followed by (and in no particular order) Fresh, Rose Bar, Tadzio and Suspicious. From top to bottom: Crimson, Garland, Sheer Dress, Raisin. The lip stains are probably my favorite pieces from the collection; they set quickly and dry down to a matte finish. My only concern is that they may be drying on the lips, which most likely explains our next item: the lip glazes. 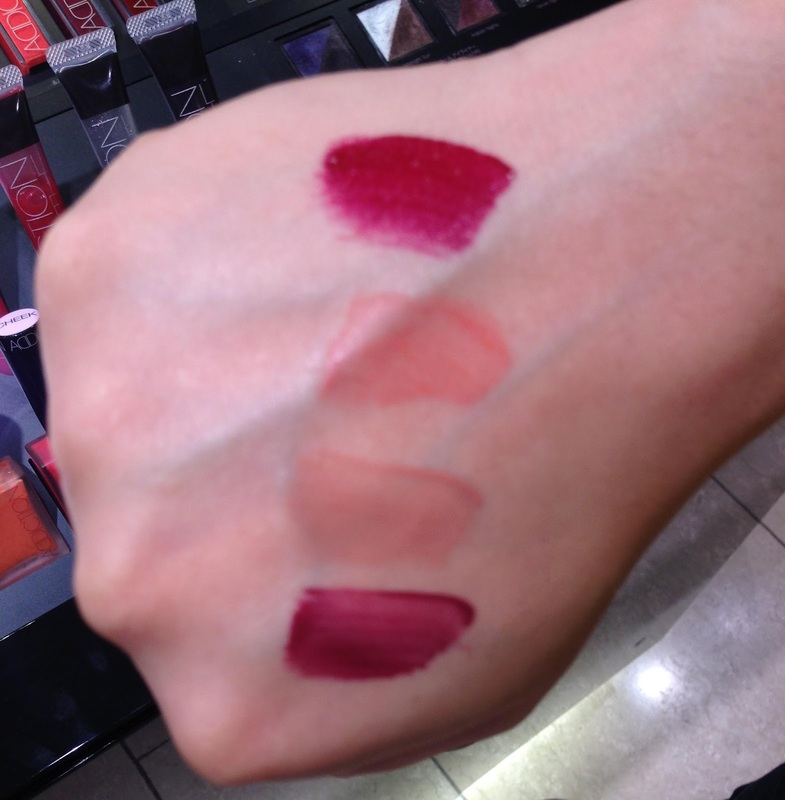 From top to bottom: Angelic Kiss, Queen of Hearts, Night Dusk, Hung Up. I found these Lip Glazes to be a total pass, with Hung Up and Queens of Hearts being the only two worth getting. It'a a total gooey-glosses mess when you try to squeeze the product out because it goes everywhere! I don't have swatches of the top coats, but they're all gorgeous! They will be making their appearance on this blog in Autumn. I'll probably be getting the Ready To Wear Eye Palette in Departure, Fresh, Revenge, Rose Bar, Tadzio, Suspicious (still on the fence on Chic and Swingin') Cheek Polishes, all four of the Lip Stains, a big maybe on Hung Up and Queens of Hearts, and all three of the top coats. What will you be picking up from this collection? Also, am I the only person creeped out by the moving image of Tint Shadows Fall 2013 Collection on the addiction website? I think she wants to eat my brains (._.;). Thanks for the great swatches! You made the Cheek Polishes look so delectable. The quad also looks promising but I think the rest of the collection is a pass for me. And yes, the model looks more creepy than anything else! In all honesty, I was left with the feeling of wanting more from this collection. Not sure if I'l be picking up the entire collection as usual. Have you seen RMK? I'm in love with it! You're so lucky to have Addiction products at your fingertips! I just went over to Addiction's website and was thinking, "What image?"... then she moved and I almost peed a little, lol. Yeah, but it's very taxing on my wallet! lol, I was startled the first time I saw her move...creepy indeed! GONNA GET ALL OF IT! Thank you for the post- been waiting for some 'gorgeous' lady to post some Addiction! The model in the addiction tint shadows caught me by surprise! I had left the browser open and turned back to my computer and suddenly she moved- thought I was in a Harry Potter movie! Now that I keep watching it- I love it's unearthly quality. I cannot wait for you to swatch departure- worried they are sheer! Tadzio is my favourite so far. Well I'm glad it could be me :) The model is captivating, but unsettling at the same time. Swatches coming soon, thank god none of the items are limited edition! by the way, I didn't realize that I had clicked on the moving image of the model. I was at home all alone at night and saw a freakish face staring at me and I totally got scared. Yep, that was FREAKY. Thank you very much for truly amazing swatches ! Would be tempting to mix the cheek polishes, for example : Revenge + Fresh, swinging + revenge...etc, etc. Thank you so much for the swatches! I had a feeling that you'd be the first to do this! I have a cousin visiting Japan very soon and have been compiling a list for Addiction goodies. I think I'm set for Tadzio Cheek Polish. Fresh looks nice too but seemed to be more watery/sheer. Could you describe the color and undertone of Raisin and Crimson Lip Stains? I'm trying to decide between the two. TIA! And yes, the moving model image is creepy. I'm glad I didn't disappoint :D Fresh and Revenge are the wateriest of the seven. Nice swatches! The dark lip stains look gorgeous! Just checked the site, that image IS freaky but I like it! I'm in love with Crimson! The image is eye catching, but unsettling at the same time. I need to get the cheek tint!!!!! Hi, I am considering of getting a few shades. I heard that Fresh is very sheer so I'm considering of getting Rose Bar. I'm pretty fair so do you think Rose Bar is more pigmented and will the shade suits me? Thanks. Rose bar is the most pigmented of the two. I've used Rose Bar on a lot of people and it works for a wide range of skin tones.